The Tamil Calender starts with Chithirai Maadham which starts from 14th of April. Chithirai is the name of the month and maadham means month. Chithirai, Vaikasi, Aani, Aadi, Aavani, Purattasi, Aippasi, Kaarthikai, Maargazhi, Thai, Maasi, and Panguni are the twelve tamil months. Among all the months, in hindu religious terms, Maargazhi maadham- (mid december to mid january) is considered auspicious – especially to the followers of Lord Vishnu. But mostly, irrespective of the sects, we can see most of the young girls singing Thiruppavai in temples. 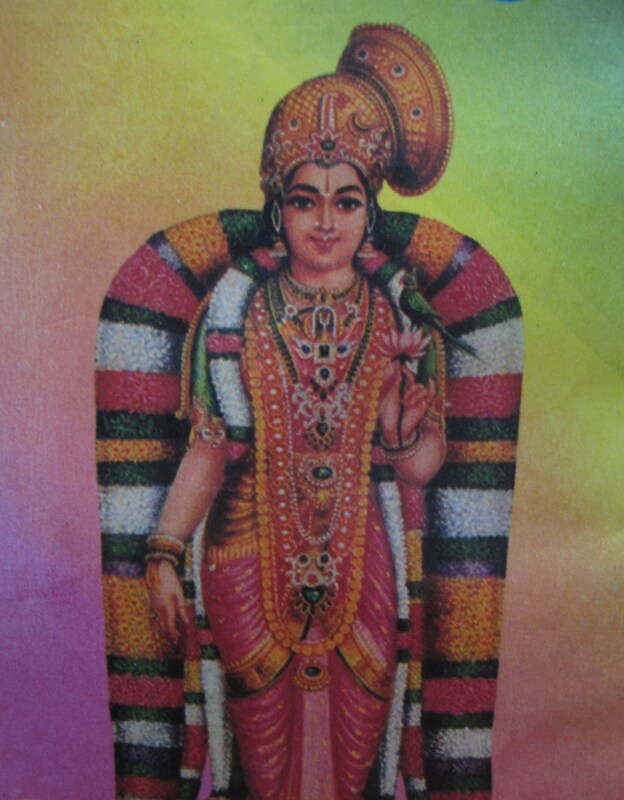 Thiruppavai is a collection of thirty songs on Lord Vishnu, sung by Andal – one of the twelve Alvars of the Bhakthi Movement in Tamil Literature. Alvars were Vaishnavite Saints as Nayanmars were Saivaite Saints. The quote below gives a better view on Alvars and Bhakti Movement. Andal observed Paavai Nonbu – the simple norms of which are explained in Thiruppavai, to attain Lord Vishnu as her husband. Andal imagines herself as a cowgirl, wakes up all the girls in Aayarpadi/hamlet of cowherds, early in the morning, to proceed towards the river bed for the early morning rituals of bathing the Lord and worshipping the Lord in tamil hymns. It used to be believed that if young girls observed Paavai Nonbu and sang Thiruppavai – the sacred hymns of Andal, they would get good husbands. Andal has also written Naachiyar Thirumozhi. Beyond the marriage connection, I think singing Thiruppavai in temples has become more of religious inclination and healthy spiritual introduction for the young in the later generations. The concept of waking up early in the morning, having a fresh shower, collecting all our friends and proceeding towards the nearby temple to sing Thiruppavai still remains fresh in my mind and heart. The thought of Maargazhi Maadham brings in wonderful memories of mist filled early mornings, the cold shower, ringing the bells of neighbourhood girls, then walking together to the temple and singing Thiruppavai… not to forget the big colourful kolams/traditional rangolis of south india, in front of every house. So, the day would start at the temple at five in the morning. We would wake up at four o’clock, have a shower and thanks to a lenient amma, have a glass of hot milk and would run to call our friends. This feels so tiring today! But it used to be really interesting those days. Every morning all the thirty stanzas are sung in a group and at the end, stanza of the day is sung. After some food for thought, there is always food for the starving tummy! As we finish singing, we collect your Prasadham – generally piping hot Ven Pongal in Dhonnai. Dhonnai is the ever special disposable cup made of palm leaves. Ven pongal is the mildly pepper spiced rice and lentil dish for those young ones who have been starving nearly for two hours singing thiruppavai. Ven Pongal has never been so tasty… may be the spiritual and literary singing made it a well earned treat! The dhonnais are so easy to dispose and give an authentic flavour to the ven pongal. The time is nearly half past six. The morning wouldn’t be over with this. After Vishnu Temple, then is the turn of Shiva temple. We move on to the nearby shiva temple – for me it used to be the Rathnagireeswarar temple in chennai. It is the time to wake up Lord Shiva with Thiruppalli Ezhuchi and also sing Thiruvembaavai. Thiruppalli Ezhuchi and Thiruvembaavai are written by Manickavaasagar – one of the sixty three saiva nayanmars or saints and one of the four main saints of Saivism. We have some more prasadham in the Shiva temple- generally puliyodharai/tamarind rice in the disposable dhonnais and walk back home to get ready to go to school. From where did the energy come to wake up early as four and come back nearly at eight, after four hours of spiritual practice in a very playful and interesting way – then proceed towards school for a whole seven hours of education…. I suppose the month of maargazhi is magical! Truly the tamil saints have made literature and religion a part of a healthy life style for generations now. It is kind of living in the present with the essence of the rich literary past. Today, priorities have changed and the world is slipping into a different culture. This new culture is to hang on to the well spread branches, than clinging on to the roots. This concept of glorifiying the mesmerising past would be minimalised to nothing, if not for those who still believe in the strong roots. But, beyond the roots and branches, Venpongal (spiced lentil rice), Sarkkarai Pongal (jaggery rice) or puliyodharai (tamarind rice) is still the most sort after things in any temple, next to the deity (or sometimes more than the deity). So now it is ven pongal time! The word Pongal as a verb means to boil or sometimes to cook in tamil. The spilling over of boiled milk is always referred to the verb pongal. As a noun, it is Pongal – the festival and Pongal – the food. The festival PONGAL – the harvest festival of the tamils falls in mid january when the new tamil month Thai starts. We shall talk about it in the forth coming posts. Now, to Ven Pongal – the rice and lentil meal! Venmai – the word from which ven pongal comes means white. The sweet pongal or sarkkarai pongal is dark brown in colour due to the jaggery in it. 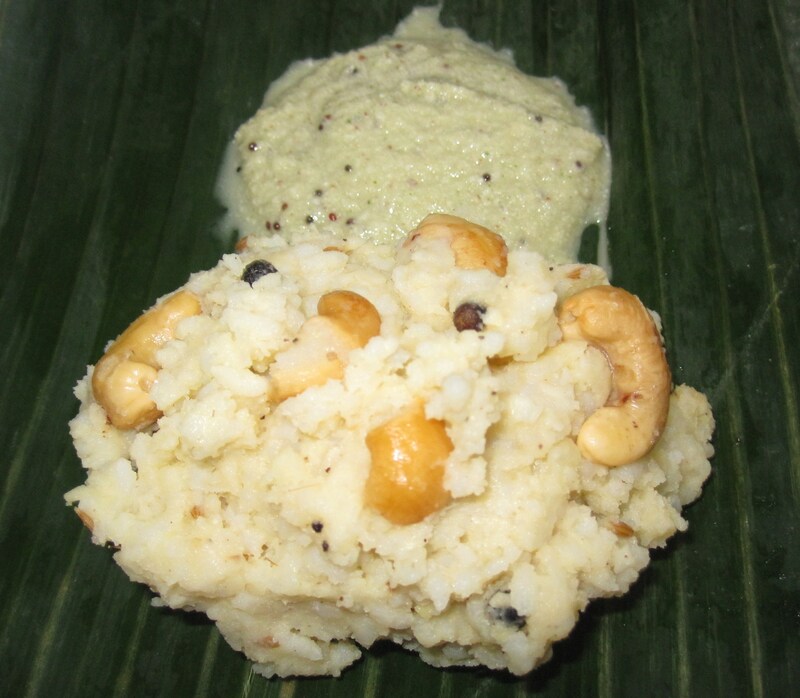 Ven Pongal, the salted, spiced meal is not exactly white but a little lentillish in colour. This is a wonderful breakfast food – especially on cold or rainy days – spiced with black pepper, ginger and cumin seeds, it works as a cold/cough reliever. All these and the added cashewnuts in ghee makes ven pongal the most favourite breakfast dish after idli or dosai in tamilnadu. Serve hot with coconut chutney (https://dosaikal.com/2011/09/20/thengai-chutney-coconut-chutney/), sambar or kathirikkai gothsu/eggplant gothsu. 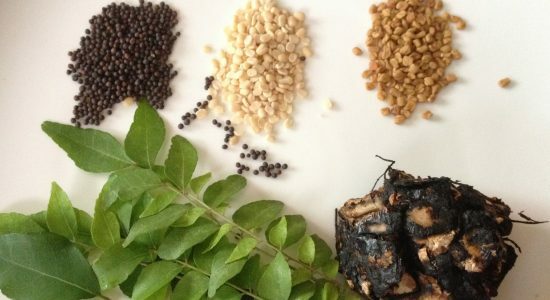 Ven pongal is always cooked with whole black pepper. Most of the kids and some elders would keep the whole black pepper aside due to the spice aspect of it. Dry grinding the spices and blending it well in the rice avoids wastage of spices and helps in better utilisation of the goodness of the spices. This way, pongal is more spicy and a very good home remedy for cold and cough. This also gives the taste of ‘kovil ven pongal’ or the ven pongal served in temples. 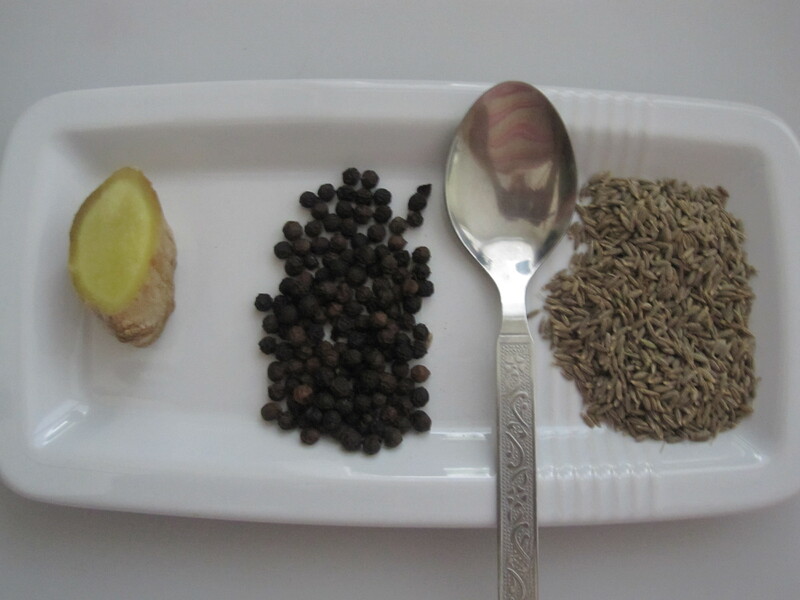 While making in this method, black pepper can be reduced to 1 tsp. Mix spices and nuts together into rice and lentil and serve hot. 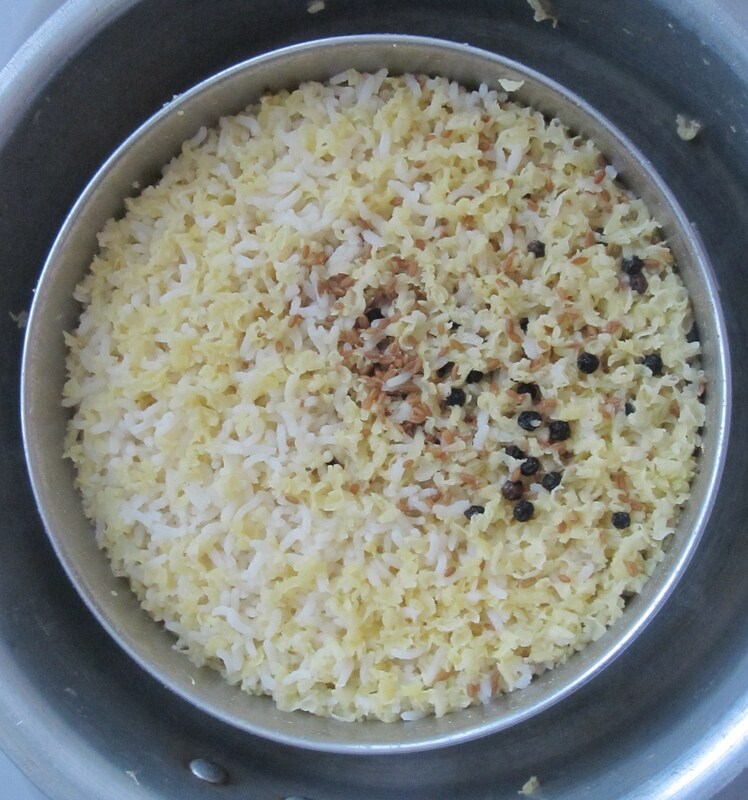 South Indian Pachirisi or raw rice is preferred as other starchy rice varieties would make ven pongal sticky. Great original recepies. Must say they are also very easy to prepare them. Yes. you are right. Most of the traditional dishes are prepared quite easily. thankyou. reminds me of the days that i have done the round of temples in the wee hours of marghazhi mornings and resounding pallandu pallandu pallayirathaaandu…. thanks for the wonderful write up. nostaligia for some of us and a veritable mine of information for the new generation. Vaazhga Valamudan! thanks for visiting and feels great to know you liked it. keep viewing. pongal vaazhthukkal!